The 2.0x gives you more of what anamorphics are for. The SLR Magic ANAMORPHOT 2.0x 50 is an anamorphic adapter with the classic Cinemascope 2:1 squeeze ratio, designed to mount in front of a lens with a 50mm or smaller clear aperture. It’s the squishier brother to SLR Magic’s earlier ANAMORPHOT 1.33x. The 1.33x mashes a 2.36:1 image into a 16×9 frame, while the 2.0x fits 3.56:1 into 16×9 (or 2.67:1 into a 4×3 frame). As a traditional widescreen image is 2.39:1, the extra squeeze may seem extraneous, but the ANAMORPHOT 2.0x’s strength lies in giving you more of the classic “anamorphic look” than a 1.33x adapter can: skinnier bokeh, more pronounced flares, and all the subtle aberrations in color, sharpness, and geometry that a 2:1 cylindrical compression lens imparts to an image. The adapter will be shipping in the near future for £1,099 in the UK or about US$1200 in the USA, and pre-orders will receive a free +1.8 diopter lens allowing closer focusing. 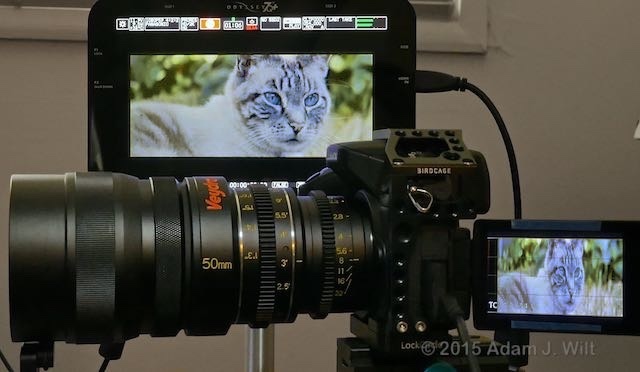 For background info on anamorphic adapters in general, SLR Magic, and the ANAMORPHOT 1.33x, check out the 1.33x preview article; for details on the 1.33x read its review. Here I’ll focus mostly on how the 2.0x differs from the less-aggressive adapter, and the pluses—and pitfalls—of using it. 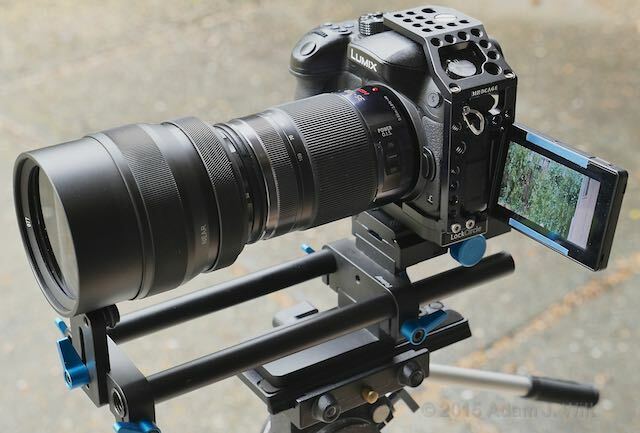 I did my testing on a Panasonic DMC-GH4 Micro Four Thirds camera. The adapter is a matte black metal cylinder, about 3¼” or 80mm in diameter and roughly 4” or 100mm in length (with focus set to NORMAL). The metal is wrapped around spherical and cylindrical glass elements with blue and purple coatings, which serve as much to generate desirable “blue anamorphic flares” as to boost contrast and suppress reflections. It weighs about a pound, or a bit under half a kilogram; it’s a lot of mass to hang off the front of a lens. The ANAMORPHOT has two rings, a NEAR / NORMAL focusing ring in front and a rotation lockring behind it. Focusing to NEAR shrinks the lens by nearly 1” or 25mm, and brings the near focusing limit down to about 1 meter or 3-4 feet. The lockring allows adjustment of the squeeze direction—the adapter’s cylindrical element must be oriented precisely vertically for proper operation. Once you’ve screwed the adapter to the taking lens, you push the lockring forward, rotate the adapter into proper alignment (tip: shine a flashlight into the lens, and set the resulting flare to be perfectly horizontal), then release the ring to lock it in place. It’s fast, and more convenient than the 1.33x’s three delicate lockscrews. The adapter mounts using a 62mm thread, and has a 77mm thread in front for use with filters, close-focus diopters, or the rangefinder focusing adapter that was shown at Cine Gear Expo. SLR Magic isn’t shipping the ANAMORPHOT 2.0x with step-up rings as they did with the 1.33x; I used the 52mm and 58mm rings from the 1.33x to mount the ANAMORPHOT 2.0x on Lumix and Voightlander lenses, as well as a 77-62mm step-down ring to attach it to Veydra mini primes. SLR Magic recommends that the ANAMORPHOT 2.0x be used on a 70mm or longer lens for full-frame or a 35mm or longer lens for a GH4 (so, for Super35mm or APS-C sensors, figure on a 50mm or longer lens). Those seem like long lenses for their formats, but consider that a 2:1 anamorphic adapter essentially halves the focal length in the horizontal direction: the lateral field of view doubles, so a 50mm lens with the adapter “sees” as wide a view as a 25mm spherical lens would (though you’ll probably crop some of that off to yield a 2.39:1 final image). 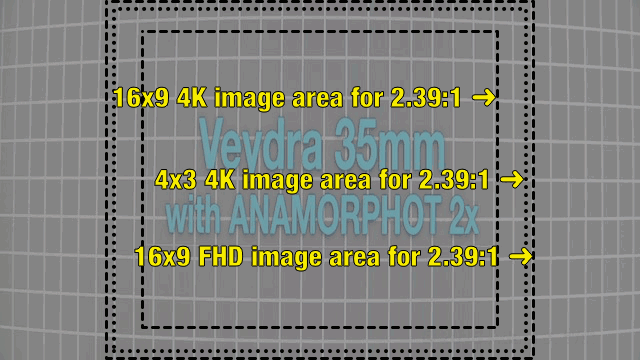 I tried using the ANAMORPHOT on a variety of lenses attached to my GH4, and found several that worked quite well. 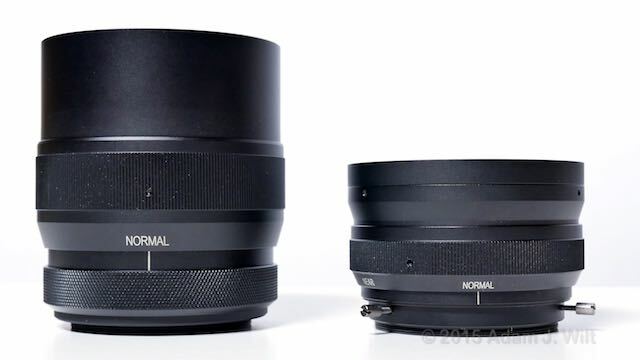 The Voightlander Nokton 25mm f/0.95, being a fully-manual, helical-focus lens, was first on the list; its robust construction made it a natural for testing a big and heavy adapter. 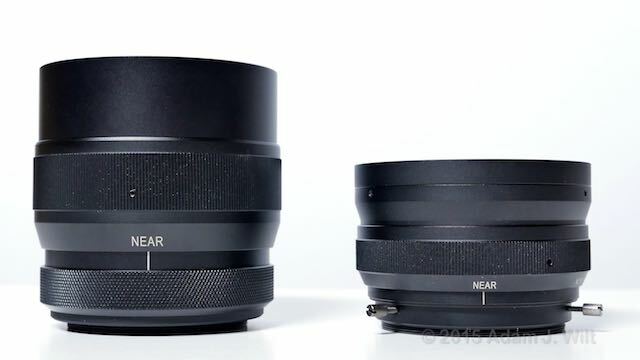 The Lumix 35-100mm f/2.8 zoom has a solid body (the zoom and focus are entirely internal), and despite the Lumix’s plastic filter threads the ANAMORPHOT attached stably. I also fitted the anamorphic to 25mm, 35mm, and 50mm Veydra mini primes using a step-down ring: the Veydras are solid-body lenses well-suited to carrying weight. In all cases, I used lens support: even a robust lens like a Veydra hangs off the camera using the comparatively flimsy MFT mount, and adding the ANAMORPHOT easily doubles the weight of any of native MFT lens (I’ve gone handheld a few times using the ANAMORPHOT without support, but I carry the rig cradling the lenses with my hand, not the body, and I’m exceedingly gentle with it). In use, the 2.0x adapter works just like the 1.33x adapter, only more so: it’s more sensitive to misalignment and focusing issues, and the 2x squeeze makes unassisted viewfinding somewhat challenging. The ANAMORPHOT screws into the front of your taking lens, directly if it has 62mm filter thread or with a step-up or step-down ring otherwise. It’s important to screw it down firmly to prevent the adapter from rotating as you adjust its orientation or focus. Even after doing so, you may want to double-check with a test chart to make sure it’s correct. The high 2x squeeze means that rectangles turn into skewed parallelograms with the slightest misalignment. Despite careful setup, none of my test-chart shots turned out to be perfectly aligned—though this misalignment was mild enough to only be apparent when flipping between charts shot with the ANAMORPHOT and those shot spherically. And while most of my field work was properly squared up, a few quick ‘n’ dirty shots showed enough funhouse-mirror distortion to be unusable. Practically speaking, this means you need to be rather finicky when aligning the lens in normal shooting, and especially vigilant aligning the adapter if you plan to shoot scenes with recognizable geometry (and faces count as recognizable geometry). The 2x squeeze affects viewfinding, too. A 2.4:1 image with a 2x squeeze (I’ll use 2.4:1 instead of the proper 2.39:1 ratio to keep the math easier) is a 1.2:1 image in the finder; anything wider than 1.2:1 will be cropped in your final show (assuming you’re sticking with the time-honored aspect ratio and not going wider with a 2.67:1 or 3.56:1 picture). 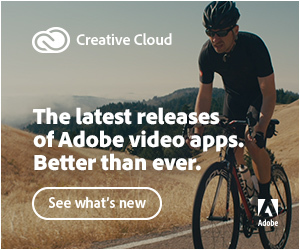 Also, of course, your view will be exceedingly skinny. 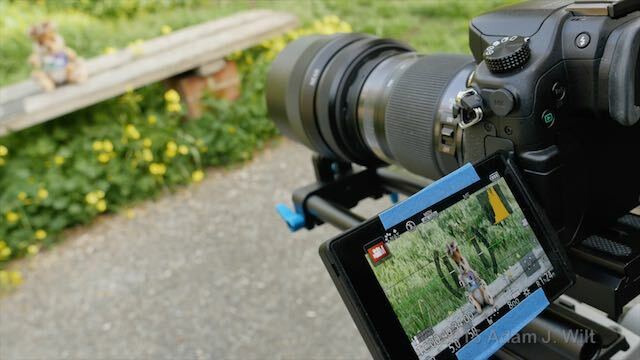 Offboard monitor/recorders including the SmallHD 500 series, Atomos Shogun, and Convergent Design Odyssey series offer image desqueezing; some allow feeding the unsqueezed image to downstream monitors, too (certainly the Odyssey does). In use, the focusing of the adapter needs to track focusing of the lens: I’ll set the adapter at NEAR for anything 3-4 feet away, NORMAL for anything 25 feet or more away, and somewhere in between when I’m focusing somewhere in between. I’ll then focus the main lens, concentrating on making vertical details sharp, then focus the adapter to sharpen horizontal detail. After two or three iterations of focusing the main lens and then the adapter, I’m ready to shoot. 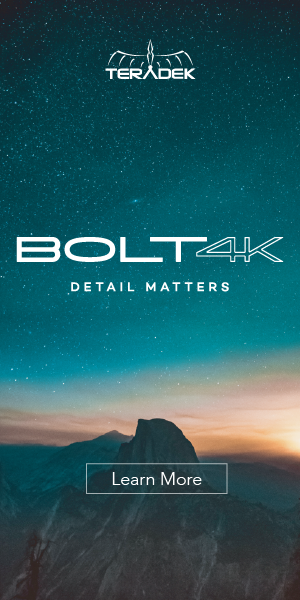 Since the adapter needs to be focused in sync with the main lens, live focus pulls are a challenge, requiring two hands, preset marks on the adapter, plenty of practice, and exquisite synchronization. 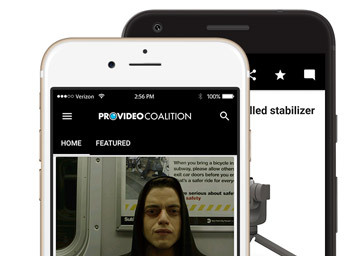 It can be done, but it’s tricky—if the two pulls don’t start and stop at precisely the same time, the focus change looks exceedingly odd—and ideally you’ll employ a camera operator, 1st focus puller, and 2nd focus puller (as was done in 1954’s “Brigadoon”). It’s not a run’n’gun setup by any stretch of the imagination. It’s often more practical to set the adapter on an intermediate focus point and stop down to allow depth of field to handle the differences, although you diminish wide-aperture anamorphic bokeh in the process. The NEAR focus limit is said to be 1 meter; in practice I found it was more like 1.3 meters or 4 feet, though the actual limit may depend on the lens you pair the ANAMORPHOT with. Diopters can be used to decrease that distance; SLR Magic’s set designed for the 1.33x adapter work fine, though I haven’t yet done a more serious test than verifying that they (a) fit, (b) reduce the focusing distance, and (c) don’t seem the screw up the image in any obvious way. 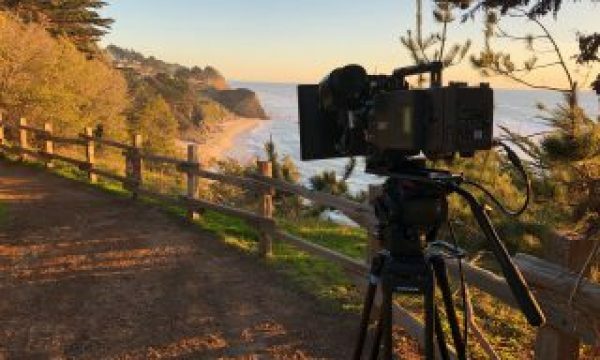 Most HD or higher-res cameras these days shoot 16×9 natively, though a couple—the ARRI Alexa and the Panasonic GH4 with firmware 2.2 or later—also capture 4×3 images specifically for anamorphic applications. And here are desqueezed, uncropped, 3.56:1, full-sensor images through a variety of lenses, with the full-sensor FHD active area outlined. All images were shot at f/7.1 (f/5.6 ⅔). The 25mm shots are blurrier than the others because I had to put the camera considerably closer to the test-pattern display than the adapter could focus—about two feet from camera to screen—else the 42″ monitor showing the pattern wouldn’t have filled the frame. When I’ve shot FHD (full-sensor) with the 25mm lenses at wide apertures, I’ve seen just a hint of corner darkening from the out-of-focus lens barrel’s vignette, but stopping down to f/4 or T4 eliminates it. When I’ve shot in the 4K 4×3 or 16×9 modes, no corner darkening at all occurs, as those modes use smaller crops of the sensor’s area. Post-processing the ANAMORPHOT’s images is simple enough, in theory: the image must be stretched 2x horizontally, or compressed 2X vertically, to restore a “flat” isomorphic picture, then reframed and cropped as needed to yield the desired aspect ratio. When the ANAMORPHOT was focused at NORMAL, I found that a horizontal stretch of 198%-200% gave me the most accurate picture (as measured across 50% of the widescreen image width, compared with a “flat” image shot without the adapter); with NEAR focus, 190-192% worked best. Put another way, in the FCPX screenshots above, I might prefer a 52% vertical scaling instead of 50% if I’m focusing on a close subject. These are small discrepancies from the nominal 200% value, but worth bearing in mind if you’re looking to avoid giving a close-up actress “anamorphic mumps”. For best results, you’ll want to note the relative focus of the adapter in your shot logs, from NEAR to NORMAL, and in editing adjust the desqueezing accordingly. If the ANAMORPHOT 2.0x were an optically perfect lens that did nothing to the image except squeeze it laterally, there would be no point in using it: you could get equally good results by shooting with a wider lens and vertically cropping the result. 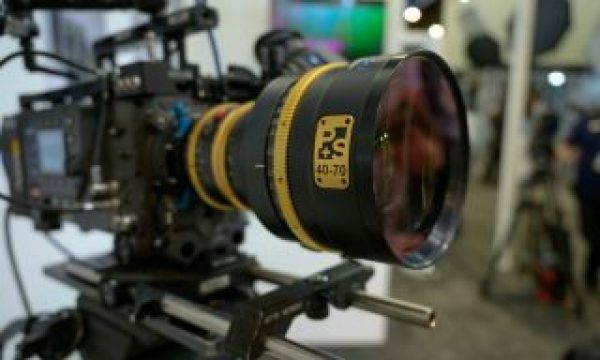 You use an anamorphic, complete with all its alignment, focusing, and post-production hassles, to get “the anamorphic look”, a combination of distortions and artifacts unique to such lenses. From a pixel-peeping performance aspect (pun intended), the lens has two different sets of characteristics: how it affects vertical detail rendering and how it affect horizontal detail rendering. Ideally, the cylindrical element in the adapter should have no effect on verticals, and maximal effect on horizontals. I’m happy to report that the ANAMORPHOT leaves vertical detail rendering untouched: the horizontal trumpets in a DSC Labs MegaTrumpet chart look just as crisp at f/2.8 with or without the adapter, and gain no “character” from the added ANAMORPHOT. The adapter is “vertically transparent”. Horizontals, though… the first thing to realize is that a 2x anamorphic essentially halves your horizontal resolution, as each pixel in the captured image is stretched to twice its original width when the image is unsqueezed in post. The adapter’s lateral squeeze forces twice as much image onto the sensor; put another way, it compresses the horizontal image of a “flat” lens into half as many photosites. That’s the nature of anamorphics, pure and simple. 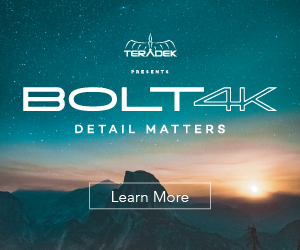 If you want HD-level sharpness, you’ll need to shoot UHD or 4K. 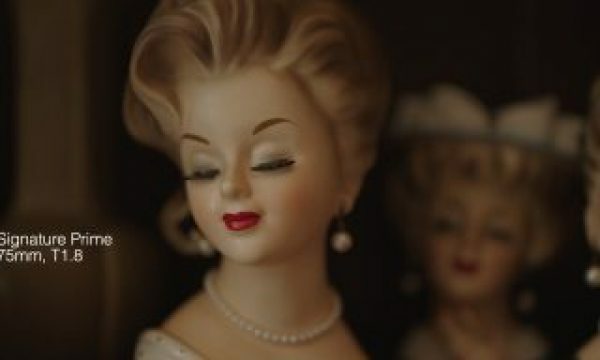 The mostly-horizontal-only barrel distortion, so visible in the wider-angle lens samples above, is another common artifact of anamorphics, and it’s to be expected (if you watch many classic anamorphic films, you’ll see this same barrel distortion in the wider shots). While a purpose-built anamorphic lens might be able to design out such an artifact, an adapter like the ANAMORPHOT can’t correct for whatever linearity compensations exist in the lens it’s attached to. Beyond that, a variety of secondary effects can arise: a general softening of horizontal detail; mild to extreme chromatic aberration (usually appearing as horizontal-only color fringing or smearing, possibly more extreme towards the edges of the image); horizontal flares ranging from small smears on highlights to broad blue bands. 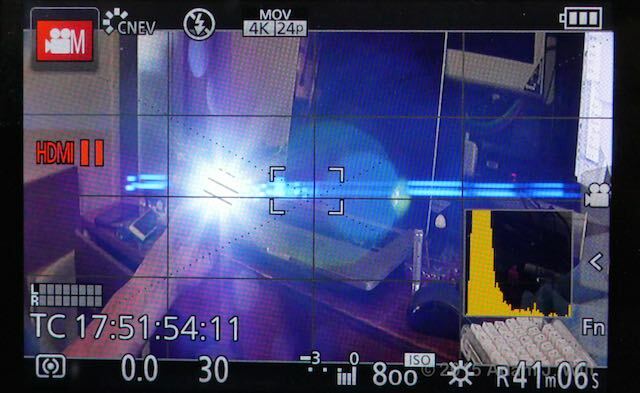 The blue flare is largely controlled by the coatings of the anamorphic elements (and the ANAMORPHOT has blue flares aplenty, by design), while the other artifacts depend on the interaction of the adapter and the lens it’s fitted to. One good illustration is the progression of the Lumix 35-100mm in the test above: as the focal length increases, the combo tends to smear colors and blur detail towards the edges of the image. Many of these artifacts diminish as you stop the lens down, but blue flare aside, all are very dependent on the lens you attach the adapter to. There are plenty of samples online, too. You’ll see commentary on some that the images are soft; bear in mind that if you shoot HD with the 2.0x and then reformat the image for a 2.39:1 presentation, you’re only using about 1296 pixels per line of the original image (plus whatever smearing or softening the adapter adds to that particular lens at that aperture), so yeah: you get that. Also, the performance of the adapter/lens combo will vary depending on the lens used; an otherwise excellent prime may be a poor match with the ANAMORPHOT. SLR Magic’s ANAMORPHOT 2.0x is longer, heavier, and pricier than the 1.33x adapter, but it gives you more of what an anamorphic is for: the constellation of artifacts and distortions that define “the anamorphic look”. Bokeh is squishier; sunstars are wider; color fringing and chromatic smearing and horizontal barreling are all more pronounced on the 2.0x than on the milder 1.33x adapter. This power comes at a price: rotational alignment on the 2.0x is more critical than on a 1.33x adapter, and your horizontal resolution loss is greater. When shooting 16×9, a 1.33x adapter gives you 2.36:1, darned close to the canonical 2.39:1, but with a 2x adapter you’ll need to crop the sides of your 3.56:1 image to get down to 2.39:1 (though a 2.0x lets you shoot wider aspect ratios all the way up to 3.56:1, of course). With an adapter instead of a purpose-built anamorphic lens, you have two focus rings as opposed to one, making focusing slower, and live focus-pulling rather difficult and error-prone. Alternatives? Dedicated 2.0x anamorphic lenses are available from Zeiss / ARRI, Angenieux, or Hawk, but they’re PL-mount lenses with stratospheric prices. 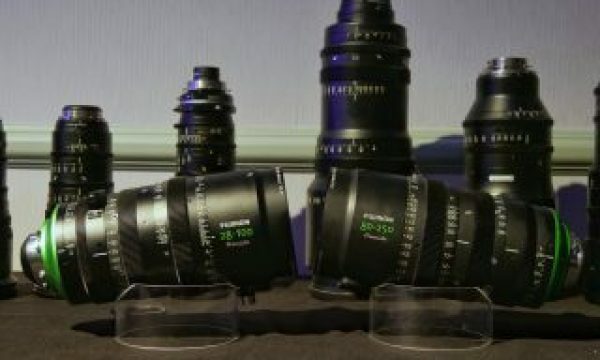 Veydra’s upcoming anamorphic primes for Micro Four Thirds are expected to cost around $5000 each. 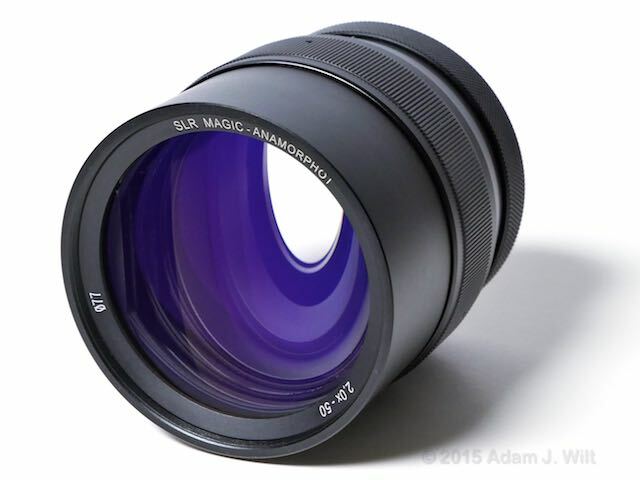 SLR Magic is developing a PL-mount prime, price unknown. Anamorphics aren’t cheap; the Veydra folks tell me that the mechanics for focusing the spherical and cylindrical elements in sync are devilishly difficult. At an expected price of $1200, the ANAMORPHOT 2.0x is an affordable attachment usable with multiple prime and zoom lenses, giving you “the anamorphic look” that only a 2x squeeze lens can give—as long as you allow the time for additional care regarding alignment and focus issues. Plenty of “anamorphic look”: blue flare, elliptical bokeh, etc. Disclosure: SLR Magic sent me a 2.0x adapter for review. I still have the 1.33x adapter and diopters from the previous review; SLR Magic has not yet asked for them back. I own the GH4 and the Nokton, Panasonic, and Veydra lenses tested; all bought for previous projects at regular market prices.